2 TAXONOMY AND DIVERSITY OF THE GENUS WOLBACHIA. 2 IMMUNITY TO EIMERIA SPP. 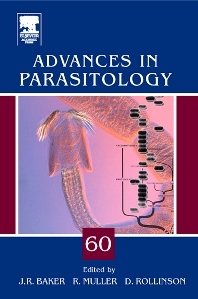 First published in 1963, Advances in Parasitology contains comprehensive and up-to-date reviews in all areas of interest in contemporary parasitology. Advances in Parasitology includes medical studies on parasites of major influence, such as Plasmodium falciparum and Trypanosomes. The series also contains reviews of more traditional areas, such as zoology, taxonomy, and life history, which shape current thinking and applications. With an impact factor of 3.9 the series ranks second in the ISI Parasitology subject category.